On Easter 2016, a church plant and an existing church merged together, creating Redeemer Fellowship. This was the result of over two years of conversations and prayer that eventually came to joyful fruition. Since this merger, we have seen God’s mighty hand working amongst us in tremendous ways. People have been baptized and our church family has continued to grow. This is exactly why we pursued the merger: to see two churches struggling in their own ways to come together and thus be stronger. Now we have a much healthier church in place of the two. This process has deeply inspired us and our questions for Redeemer’s future. Where do we go from here? What is next? Our church is growing, our children’s space is getting maxed out - do we start a second service? Do we plant a new church? Do we do both? When the merger occurred, we simplified our mission statement to reflect what we hoped would be our future: “Love God, Make Disciples of Jesus Christ and Plant Gospel-Centered Churches.” We did not want the merger to be the end of our story, but rather only the beginning. We hoped that this church would grow to the point where we did need to launch a second church. That day has arrived! That being said, we chose to plant another church. As we plant another church, we decided it would be best that we not duplicate our efforts and reinvent the wheel, but rather seek to carry out the mission and vision of Redeemer Fellowship here in Toms River into another city. We will use the same name (Redeemer Fellowship), mission and vision, resources and people of our mother church and plant a new church in a different city. This will be a another Redeemer Fellowship, but more than simply another campus or satellite location - it will be a distinct congregation but one that is collaborative and unified with its mother church in every way. This new church plant will be locatied in Point Pleasant Borough. 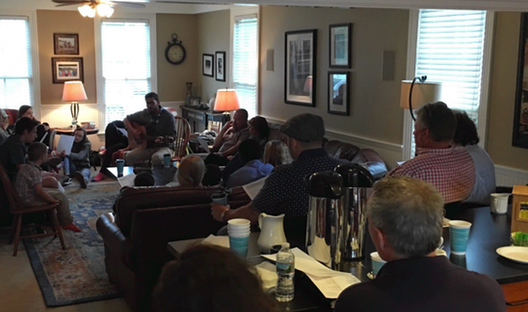 On 27 May, 2018 Redeemer Fellowship of Point Pleasant had their first ever Sunday morning home gathering! Throughout this summer this new church will be having preview services, and some more home-church gatherings as they prepare to launch in September of 2018.